The vision behind the production LiveWire™ motorcycle began with Project LiveWire, revealed as a prototype in 2014 as an effort to gauge the potential of an electric-powered motorcycle as envisioned by Harley-Davidson®. Drawing from the experiences of the Project LiveWire demo tour and following an intensive development program the Harley-Davidson LiveWire model offers the rider a new, high-performance motorcycling experience. 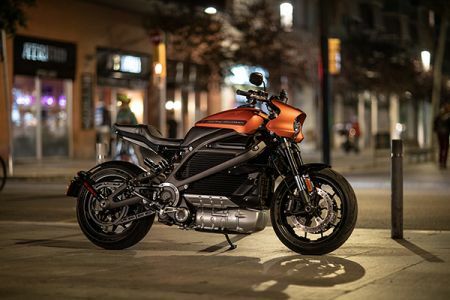 Propelled by the immediate torque of an all-electric motor, the LiveWire motorcycle is capable of astounding acceleration with just a twist of the throttle – no clutching or gear shifting required. A low centre of gravity, rigid aluminium frame and premium adjustable suspension components give the LiveWire dynamic handling. Performance and range are optimised for the urban street-rider. Powertrain performance is maximized by a chassis designed to deliver nimble, agile handling for confident control on urban streets and a thrilling ride on curving back roads. Combining the powertrain as a stressed member within the aluminum frame to increase rigidity, the LiveWire features premium high-performance fully adjustable Showa® suspension. The Showa® BFRC-lite® (Balanced Free Rear Cushion-lite) mono-shock rear suspension is complimented by Showa SFF-BP® (Separate Function Fork-Big Piston®) up front, balanced to match the performance and adjustability of the rear shock and deliver exceptional low-speed damping control – ideal for composed control in typical urban riding conditions.